Prefixed by the work of Greek provenance “idios”, which means “particular”, “belonging to itself” or “singular”, the rhythm to which “idiorrythmie” refers is particular and special. The programme that runs under this title has a goal of putting in place different durations and rhythms of the pacing of exhibitions. IDIORRYTHMIES will develop as a series of invitations to artists whose projects require others working rythms. The artist and the museum thus accompany each other mutually over several weeks (if not months) to reciprocally exchange and nurture research, desires and practices. The term “idiorrythmie” is borrowed from a lecture by Roland Barthes that he had named “How to Live Together”. Conviviality, cohabiting, sharing, hospitality and everything which gives rise to (or is given rise to by) the coming together of affects and bodies, are certainly targeted by the programme. Reframed, transposed, reformulated, or updated, this concern for the conditions which make being together possible is common among the invited artists. However, conviviality is not only a theme but also a reflection on the museum. Imagining and testing other space-times aims at making the museum a space that can catalyse forms of living together. Not only a space to visit, but also a space to inhabit, together. “In contrast to traditional criticism, in which the subject develops an argument on his own object of study, in my case the criticising subject and the criticised object coincide in the same time and one place. What time? Not that of clocks, Chantal Maillard would say. What place? My body, this body which occupies me, Joâo Fiadeiro would say.”Sweating Discourse is a meeting which sweats, a meditation on the capacity to incarnate a discourse, a defence and bodily movement as critical space in opposition to the dancer conceived as the subject of subaltern execution. Such a claim would also apply to the figure of the mediator who, like the dancer, should be the site of a critical and creative eloquence. Length: 60 minutes. Premiere: 2013. With the support of Mar Medina, Paul B. Preciado, Jaime Conde-Salazar and the artist’ sweaty community. Adults (+18), no age limit. No knowledge of dance required but desire for movement is essential. The principle of Contact Improvisation is to dance while keeping at least one point of contact with someone else, sharing the centre of gravity with another body and thereby abandon individuality in order to experience coexistence and take part in a community that relies on trust and care. This two-day workshop anticipates and warms up for the performance The Touching Community with choreographer Aimar Pérez Galí and some performers of the piece. 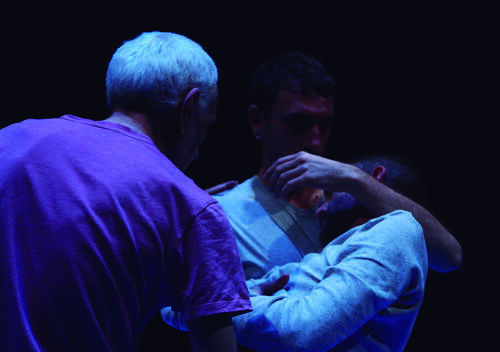 The Touching Community is founded in the chronological coincidence of the 80s and 90s of Aids and Contact Improvisation, a dance technique initiated by Steve Paxton in which movement is improvised, with the physical contact between two bodies as its starting point. Coincidence therefore of the politics of immunity on one hand, and touch on the other. The Touching Community is an intimate and affective piece of work which focuses on an era that concerns us –that touches us– still. A work of memory about dancers who stopped dancing too soon, on a community who drew their strength from their vulnerability, and on touch and contact as survival tools. Above all else, it is a work which speaks of love, change and fear. Aimar Pérez Galí works in the field of dance and performing arts as a dancer, performer, pedagogue and maker. Graduated by the Highschool of Arts of Amsterdam, has worked in The Netherlands during several years and currently he develops his professional career in Spain, where he just graduated from the master degree on museology and critical theory, Independent Studies Program, at the Museum of Contemporary Art of Barcelona. His work unfolds between research on dance, movement, pedagogy and the development of new process-like approaches to the performance practice. Among his last performance works there is Delta, A Post-Believe Manifesto, the performative lecture Sudando el discurso and The Ping Pong Dialogues. He has collaborated and collaborates with makers such as Xavier Le Roy, Nicole Beutler, Nora Heilmann, Andrea Boziç, David Zambrano, Abraham Hurtado / AADK, and Silvia Sant Funk among others. He has been a member of the jury of the Miquel Casablancas’ Visual Arts Prize 2013 and since 2010 he is artistic director of Espacio Práctico, a self-instituted space in the center of Barcelona. IDIORRYTHMIES # 1 AIMAR PEREZ GALI has developed a network of exchange and accompaniment of the project which includes Le Conservatoire de Bordeaux ; ENIPSE; Le Girofard.